Over the past few months we have been collaborating on a quilt via text message, photo emails, screen grab fabric swatch ideas and one big Sewing Summit sewing session. After the top was pieced at Sewing Summit, Kelsey brought this beauty home to back, quilt and bind it in time for a joint gifting to a very special great aunt who just turned 90 over the Canadian Thanksgiving weekend. We both made the trip back home to visit her for her birthday and I'm sure you can imagine we all had a great deal to be thankful for that weekend. Because our great aunt loves simplicity and isn't fussy about florals or very feminine design, we thought wonky stars with gorgeous semi-solids might be the best way to balance glamorous fabric and a sleek, simple, modern design. This quilt top was made with lap warming in mind, so when we planned it out, the focus was all about the texture. Equal parts Oakshott and Shot Cotton, the wonky stars were made to be focal points all in their own right. While the Kaffe Fassett Shot Cotton created soft and delicate stars, the Oakshott Cotton added depth and gloss. To let these solids maintain their shine, Kelsey chose to stitch in the ditch around each star, then fill in the entire background with FMQ swirls. A mini ode to Starry Starry Night by van Gogh, pure genius that he was. If only he had quilted something, I'm sure it would have been divine. Amanda picked out the perfect backing and binding fabric down in California by sending multiple photo texts. It was the perfect 10 minute break for Kelsey from work, and felt a bit like having a personal fabric shopper! Amanda found this background print in the Aboriginal section of her LQS and we both agreed it was perfect. When we were little our great aunt adored sweaters that reflected a very similar esthetic and style. While it's not the typical modern print that either of us would normally gravitate towards, it felt a bit like hitting the jackpot. When the quilt was gifted it it was easy to see our great aunt agreed. Quilting: stitch in the ditch around each star, then FMQ swirls in the background. This finish coincides with the Fall 2013 Bloggers Quilt Festival over at Amy's Creative Side. We are linking up this finish in the Quilt Photography Category along side a number of very talented bloggers. Be sure to swing by Amy's blog to check out all of the amazing link ups, and you still have time to link up a project yourself, so put on your party pants and get your linky on! This is Kelsey's second completed project for the Q4 2013 Finish A-Long - read more about her other goals here. It's gorgeous! Y'all did a great job! I, too, think the quilting really adds to the overall look. So glad it tickled your aunt! It's divine! Love the quilt, love the quilting, love that I got to see part of mad stitching process to get it finished! You both rock! Stunning, ladies!!! Your quilt is absolutely gorgeous. 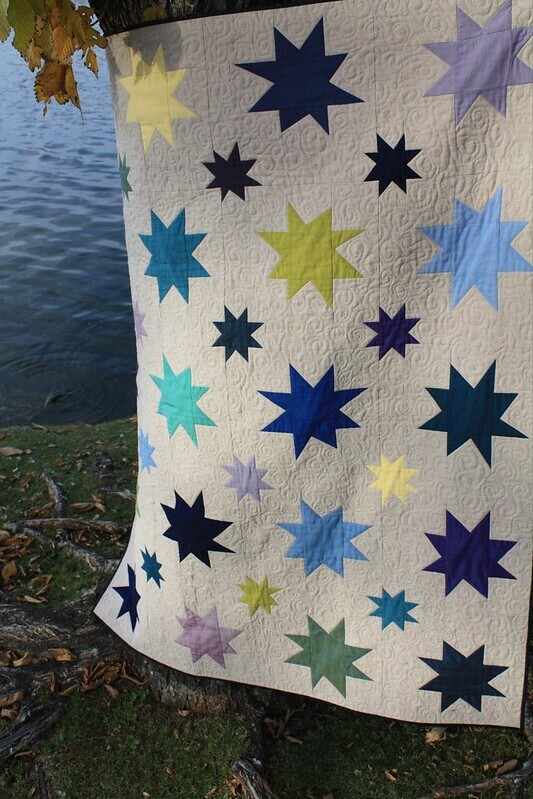 I love the simplicity of the solids, paired with the different sized stars. And K - the cinnamon bun swirls are PERFECT and soooo lovely. Your aunt must have absolutely loved this gift!!! Lovely! 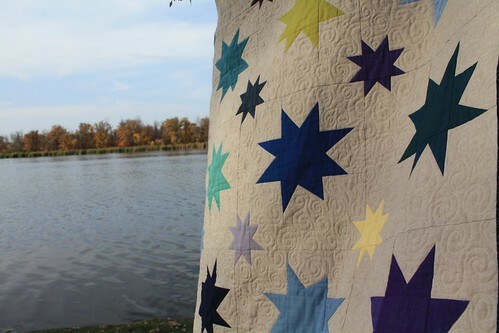 Quilting really accentuates the stars...perfect! A&K, it's fantastic. Who did the quilting? Love it - it's just right for this project. *sigh* this turned out so well, you two!! The quilting is amazing. :) You should consider entering it into the blogger's quilt festival! I bet your great aunt was thrilled!! I agree - enter this in BQF. It's beautiful. This is beautiful, I love that the stars are not quilted but the background is densely quilted, I love that the gold stars actually seem to shine. 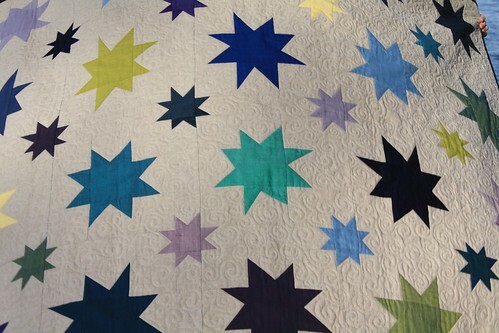 I love the simplicity of using quasi-solids for the stars with the crisp white background. Stunning! Those solids are great! This is so, so pretty! The colors are perfect. It is lovely! The stars are so sweet! beautiful quilt, and the quilting really sets the whole thing off! I love how the quilting makes the stars really pop. Lovely! Turned out fantastic ladies! 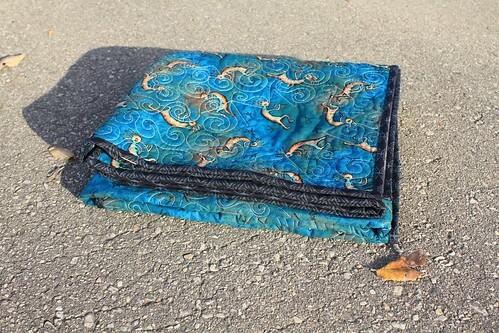 The quilting is just perfect for the stars! And the stars... gorgeous! What a great gift for your great aunt. I can see why she loved it. 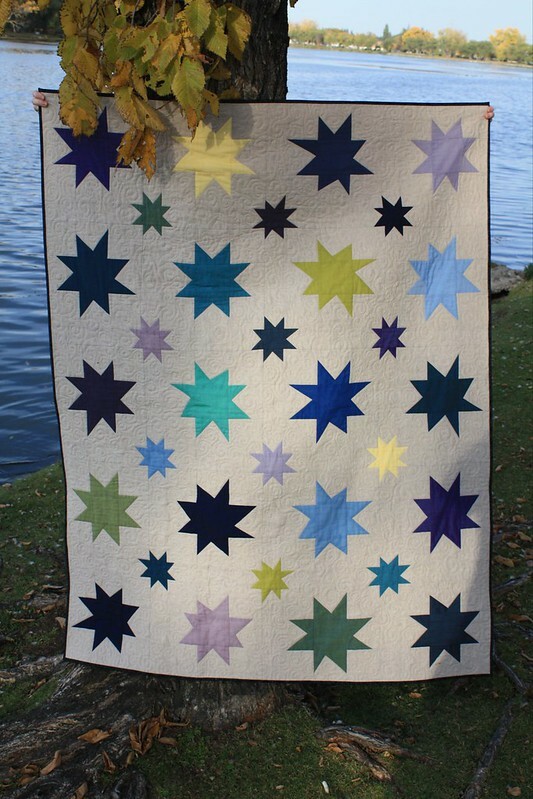 A really wonderful wonky star quilt! Shot cottons! So gorgeous. Love the decision to leave the stars unquilted... Makes them pop! Love the quilting and the colours. Beautiful! What a fabulous loving collaborative gift! I love this quilt, the collaboration and the photos. Great quilt and I am sure it is so special to your great Aunt. Wow, stunning quilt! I can imagine it's 1000 times better in person, when you can really see those gorgeous Oakshott fabrics. I'll bet this quilt feels wonderful too. Love the wonky stars! Lucky great-aunt! I love star quilts the best.